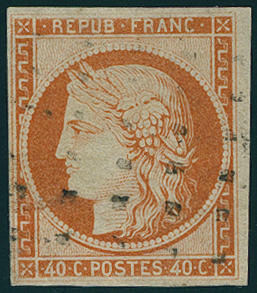 3686 ⊙ 5a 40 C. Red orange, wonderful having bright colors, on all sides with enormous margins used extremely fine copy. Michel 550,- €. 3687 ⊙ 6a 1 Fr. 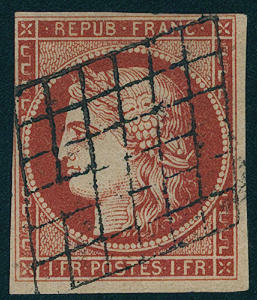 Orange red, the famous \"VERMILLON VIF\", wonderful fresh colors and on all sides perfect margins, only left above little touched, with especially nice centric and clear mounted lozenge. 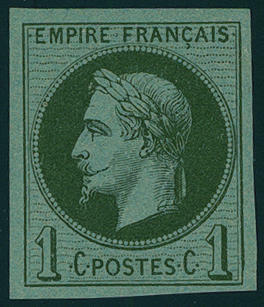 An especially attractive copy this large France rarity, the in almost all collections is absent! Photo certificates Miro / Paris and pascal Scheller / Paris. Maury 25500,- €. 3688 ⊙ 7a 1 Fr. 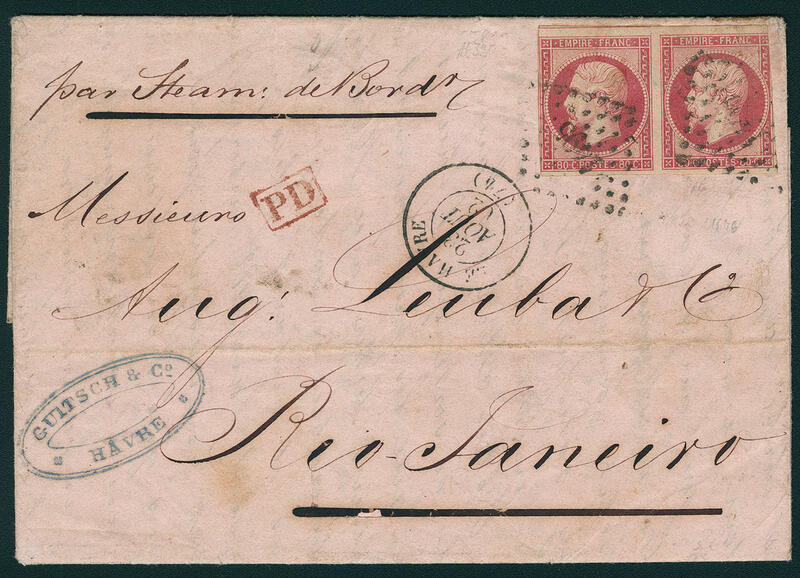 Carmine, horizontal strip of four with large point cancel, corrected, left at the bottom in the outer margin small edge split, very decorative copy this extraordinarily rarely unit, photo expertize Georg Buehler. Ceres catalogue 8000,- €. 3689 ⊙ 7a 1 Fr. Carmine, wonderful having bright colors, on all sides with enormous margins used outstanding quality, left with large parts of the neighbour. An exception copy! Expertized Buehler. Michel 1000,- €. 3690 ⊙ 7a 1 Fr. 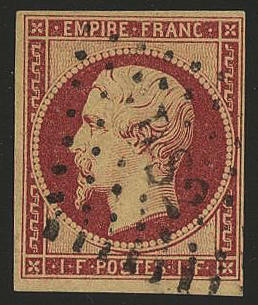 Carmine, having bright colors and on all sides with enormous margins used extremely fine copy. Michel 1000,- €. 3691 ∆ 7a 1 Fr. Carmine, wonderful fresh colors and on all sides good margins on beautiful letter piece with clean and full mounted dot lozenge \"DS2\". An outstanding quality of this rare issue! Photo expertize from the Weid. 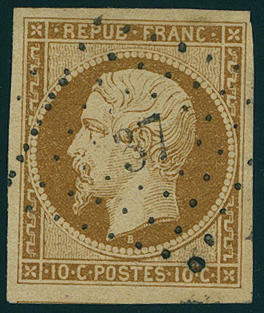 3692 ⊙ 8a 10 C. Yellow brown, Napoleon, having bright colors, on all sides with enormous margins used outstanding quality with centered number postmark \"37\", expertized Schollmeyer BPP. Michel 700,- €. 3693 ⊙ 8a 10 C. Yellow brown, having bright colors, on all sides with enormous margins used outstanding quality. Michel 700,- €. 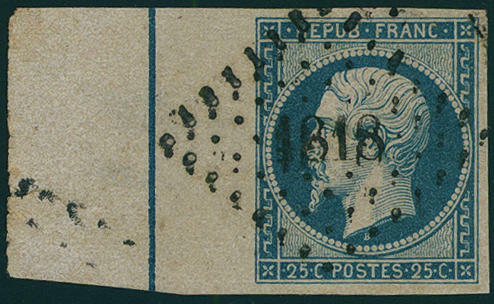 3694 ⊙ 9a 25 C. Blue, Napoleon, having bright colors and on all sides with enormous margins used outstanding quality, left broad-brimmed \"piece of tenderloin D´ENCADREMENT\", in the left margin tear, with centered number postmark \"1818\". An exception copy! 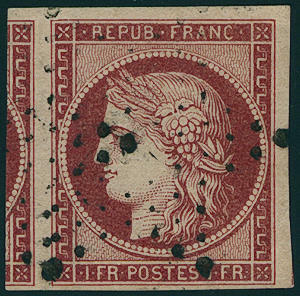 3695 ⊙ 10a 1 C. Napoleon, horizontal pair, fresh colors and large margins all around with double circle cancel, superb in every respect (choice copy). 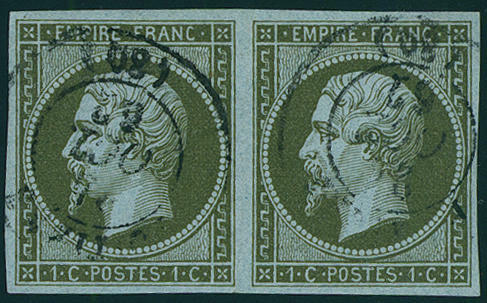 3696 ⊙ 11a 5 C. Yellow green, horizontal pair, fresh colors and large margins all around with two ring cancel \"PARIS\", superb in every respect (choice copy). 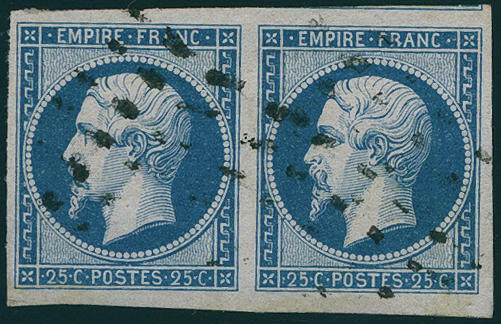 3697 ⊙ 14 25 C. Napoleon, horizontal pair, wonderful fresh colors and large margins all around, above with parts of the neighbour, outstanding quality! Expertized Köhler. Maury catalogue 725,- €. 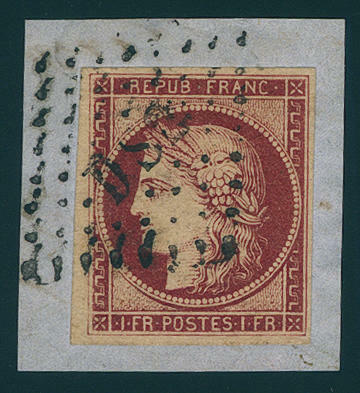 3698 ✉ 16c 80 C. Carmine rose, Napoleon, horizontal pair, fresh colors, three sided having full to wide margins, right touched, on cover with number postmark \"1495\" and additional two ring cancel \"LE HAVRE 23. AOUT. 62. \" with complete content to Rio de Janeiro. An attractive cover with rare destination! Signed Köhler. 3699 ⊙ 17a 1 Fr. 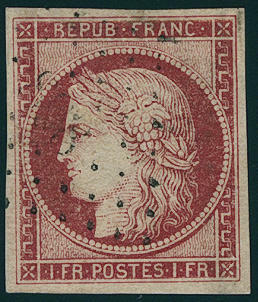 Napoleon, wonderful fresh colors and good margins, neat cancelled in perfect condition. 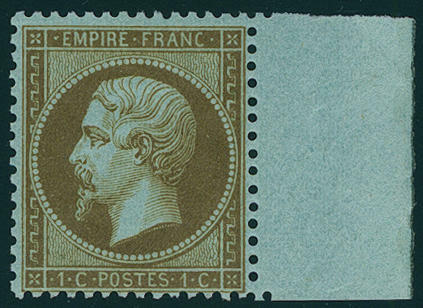 An outstanding quality of this classical France rarity! Photo expertize from the Weid. Michel 4200,- €. 3700 ⊙ 17a 1 Fr. 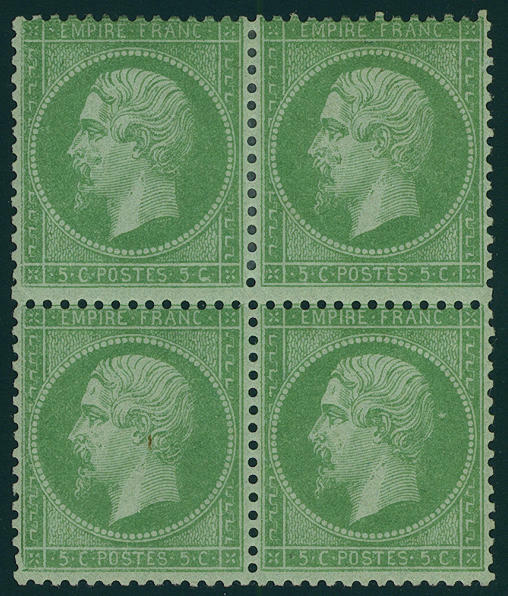 Carmine, wonderful having bright colors and good margined outstanding quality with especially nice and clear mounted lozenge stamp \"DS2\". A very nice copy this Europe rarity! Photo expertize \"excellent condition\" von der Weid. Michel 4200,- €. 3701 ⊙ 17a 1 Fr. 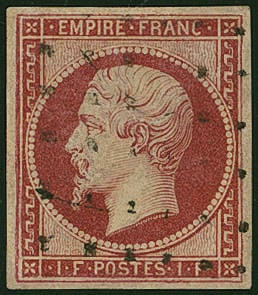 Napoleon, having bright colors and neat cancelled repaired decoration piece of this classical France rarity! Michel 4200,- €. 3702 ⊙ 17b 1 Fr. 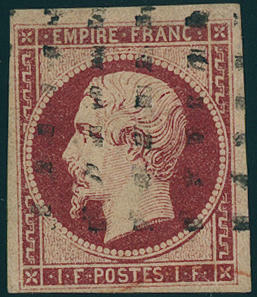 Dark carmine, Napoleon, the good colour in the horizontal strip of four, wonderful fresh colors, three sided having full to wide margins, right to the margin line cut, with large point cancel. A particularly beautiful and attractive unit for the sophisticated special collection! (Yvert no. 18 a). Photo expertize Roumet. 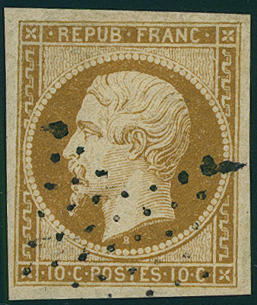 Michel for the single stamps, free of premium for the scarce unit already 20000,- €. 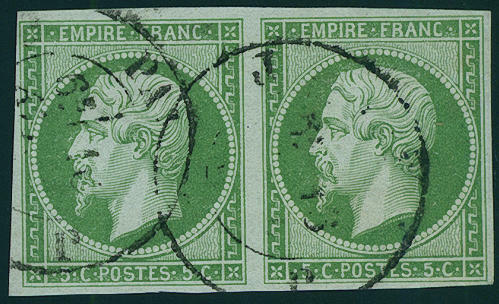 3704 / 19a 5 C. Green on greenish, Napoleon, wonderful having bright colors block of four, in perfect condition unused, the lower pair even in perfect condition mint never hinged, a particularly beautiful unit, outstanding quality! Expertized Roumet. Yvert 1750,- €.